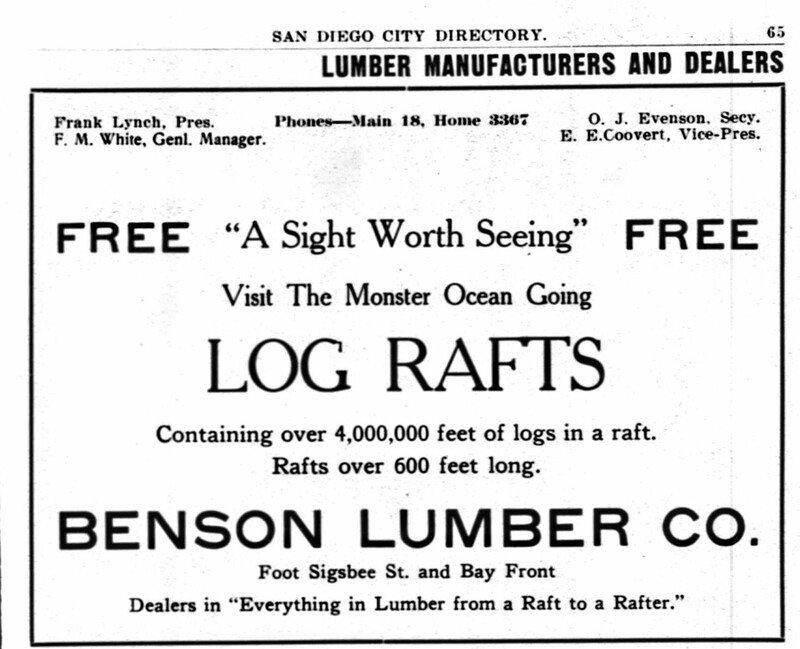 I came across this ad in a 1914 San Diego city directory and was fascinated. My mental image of log rafts had been confined to Huck and Jim lashing a few logs together. But four million feet of logs comprising a raft over 600 feet long? I did a little digging and discovered that this was a regular part of traffic in San Diego harbor every summer from the early 1900s to the early 1940s. At the facilities of the Benson Lumber Company in Oregon, thousands of harvested tree logs were fastened together with tons of metal chains into literal floating islands an acre or more in length. Then they were towed by tugboats on down the coast to Benson’s docks in San Diego. The raft, which took 17 days to complete the trip, was described as “practically the same dimensions as its predecessor” at 720 feet long, 50 feet wide, drawing “between 23 and 24 feet of water” and “containing approximately 4,500,000 feet of logs,” according to the article. Hi Alexa: Thanks, glad you enjoyed it. It was a surprising story to me and it’s attracted some other comments as I’d expected. Very Very interesting! Thank you so much! You’re quite welcome. It was a really unique story and I’m glad I found out about it. My father used to describe these rafts to me that he witnessed when he was a boy. He also said these rafts would shed logs all the way down the coast which would become navigation hazards to small craft. Thank you, Michael, for sharing your father’s experience of seeing these giant rafts. I’m sure a lot of people must have observed them over the years. And I’m not surprised that some logs would have broken away and become navigation hazards. Thanks for your interest!